Check out Tobi's Renée Long Hanging Belted Faux Suede Skirt Your wardrobe is craving more studs. Get ready for your next night out with The Renée Stone Faux Suede Skirt. This suede A-line skirt features a high waisted construction, a belt with eyelets and a buckle, gorgeous studs throughout, and a back zipper. Pair this studded skirt with a bodysuit and high heels. Your wardrobe is craving more studs. Get ready for your next night out with The Renée Stone Faux Suede Skirt. This suede A-line skirt features a high waisted construction, a belt with eyelets and a buckle, gorgeous studs throughout, and a back zipper. Pair this studded skirt with a bodysuit and high heels. Your wardrobe is craving more studs. Get ready for your next night out with The Renée Black Faux Suede Skirt. This suede A-line skirt features a high waisted construction, a belt with eyelets and a buckle, gorgeous studs throughout, and a back zipper. 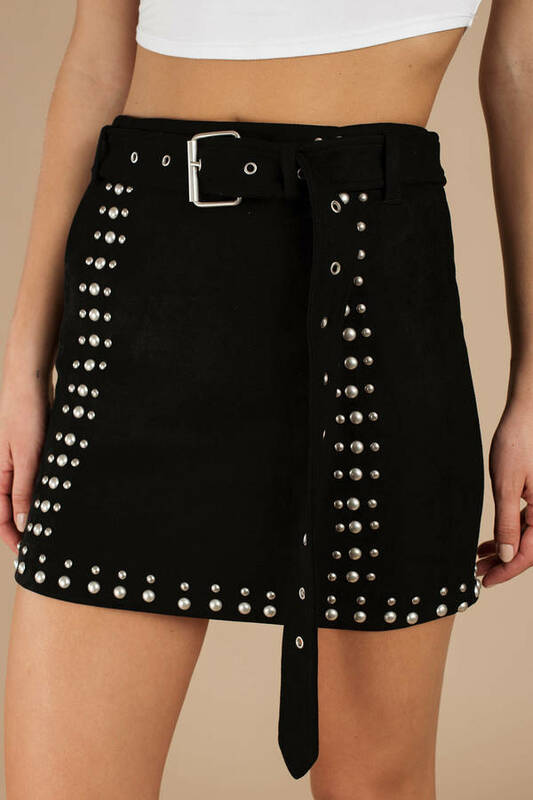 Pair this studded skirt with a bodysuit and high heels.